Should you work part-time in retirement? Retirement does not have to be an all-or-nothing proposition when it comes to drawing income versus earning more of it. This column advocates a couple of things: one, drawing gradually on more and more multiple streams of income; and two, continuing at least on a part-time basis the stream of income known as earned income. 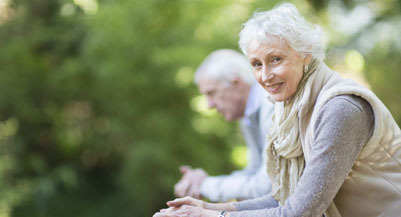 Indeed, an analysis commissioned by Larry Berman, host of BNN’s Berman Call and Chief Investment Officer of ETF Capital Management, showed the powerful impact of earning just $1,000 in part-time income each month between the age of 65 and 75; or in the case of couples $2,000 a month between them. 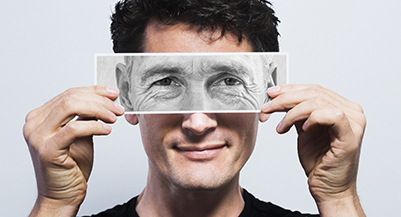 The analysis prepared by ETF Capital’s Fabien Ouellette vividly shows that compared to earning nothing extra at all after the traditional retirement age of 65, earning such modest amounts of extra income (whether as a part-time employee or on a self-employed basis) magically accomplishes two things. The outcome is much different for a couple earning just $2,000 a month between them part-time after 65 and going until 75 (shown as the grey line in the chart). That’s about $250 per week per spouse. The dramatic effect is that even that modest amount of income delays the portfolio’s drop below zero beyond their early 90s. During the ten-year period of working part-time, not only does the nest egg not decline the first ten years, but it actually rises! 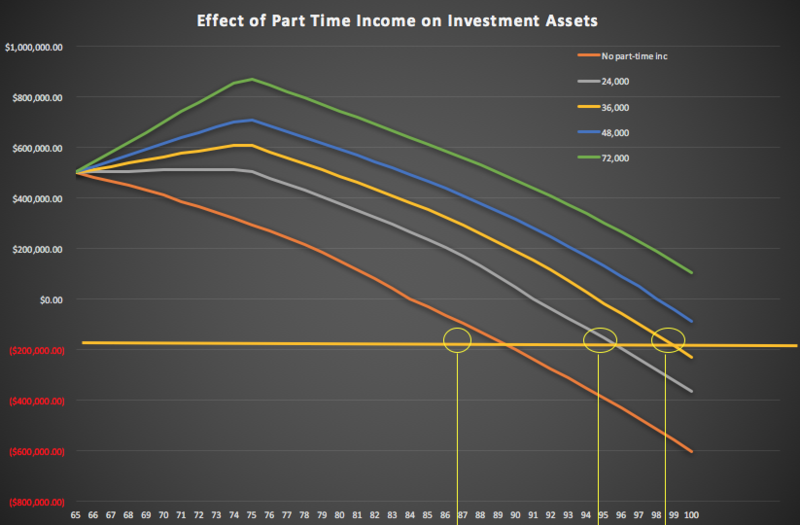 The effect is that by the time you reach 75 and finally stop working even part-time, the portfolio declines from a higher level and much more gradually. Of course, the more you work, the better: for a couple earning $3,000 a month between them (the yellow line), the portfolio still has more than $200,000 by their 90s! Similarly, the analysis also shows what happens if you work extra hard, which many might argue wouldn’t even qualify as retirement or even semi-retirement. At $4,000 a month (shown in blue) the portfolio is barely depleted at all by the time they reach 100! Finally, in the most extreme case of earning $6,000 a month – which is virtually a full-time job for many – the portfolio almost doubles to $870,000 by age 75 and virtually never declines below zero, no matter how extended your longevity proves to be. (That’s shown in the green line on the chart). Remember, even in the latter extreme case of working almost full-time to 75, you cease to work at all after that age—but the benefits of those ten years of part-time work extend right to the end of even a long lifetime. 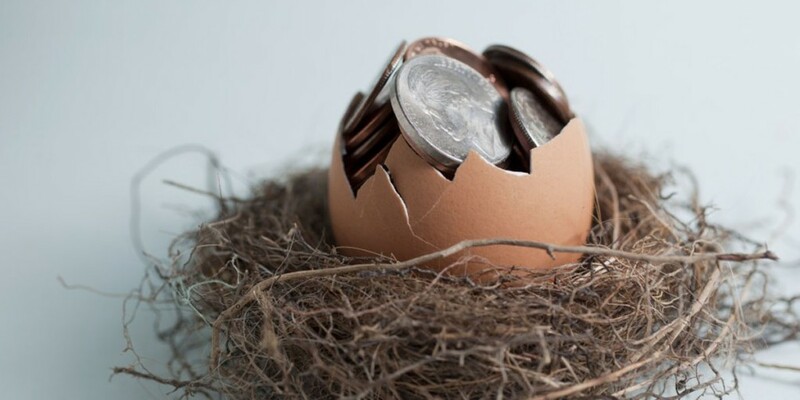 ETF Capital cautions that its calculations relied on certain assumptions on market returns, tax rates and what you do with the surplus money, and that relying on extra work at this age is NOT a substitute for a good financial plan. We could of course talk about the social, health and other benefits of working part-time in retirement (in addition to the financial benefits discussed here) but that would require an entire book to describe. In fact, I’ve just co-authored a book on just that subject, an excerpt of which ran in the recent Summer issue of MoneySense, and which is mentioned below. Jonathan Chevreau is MoneySense’s Retired Money columnist and the founder of the Financial Independence Hub. He can be reached at [email protected]. He and Michael Drak have just published the book Victory Lap Retirement.